We are pleased to introduce an addition to Steady Options offerings. Steady Momentum is for long term investors who want to apply the concepts of momentum to their ETF and options portfolios. Fully collateralized put trade alerts on both the S&P 500 and MSCI EAFE indices. These underlying indices represent the majority of the global equity market, and provide substantial option market liquidity. When momentum signals indicate a change in trend for each underlying index, simple risk-management adjustments will be made to move trades further out of the money until upward trend signals resume. Performance tracking will be based on a hypothetical $100,000 account, although subscribers could allocate much less. A single cash secured EFA contract would only currently require around $6,300. ETF trade alerts producing a low-turnover multi-factor globally diversified portfolio that may be suitable for long-term portfolios. Potential portfolio adjustments occur on a monthly basis, and subscribers could allocate basically any dollar amount. Cash secured put writing has been shown to historically provide returns similar to the underlying asset, yet with less volatility and drawdown. We contend that over time the strategy must work, otherwise it implies that stock market insurance would be available for free. The goal for the put write alerts is to produce higher risk-adjusted returns than the underlying S&P 500, Russell 2000 and MSCI EAFE indices, and higher absolute returns than the strategy benchmark, PUTW (Wisdom Tree CBOE S&P 500 PutWrite Strategy Fund). Risk adjusted performance measurements like the Sharpe Ratio take into account both returns and volatility. The goal for the ETF alerts is to produce both higher risk-adjusted and absolute returns than the strategy benchmark, which is 80% VT (Vanguard World Stock ETF) and 20% AGG (iShares Core US Aggregate Bond ETF). Both the option and ETF strategies will be available to those interested in a professionally managed account. Both strategies are simple to follow and very low maintenance, making it easy for subscribers to replicate results. Put contracts will be collateralized by low risk fixed income ETF's. Skillful execution of limit orders will have little to no impact on subscriber success. If you're looking for constant action and high risk/reward trades, this service isn't for you. Some option selling services attempt to make in a month what our put selling approach is expected to make in a year. 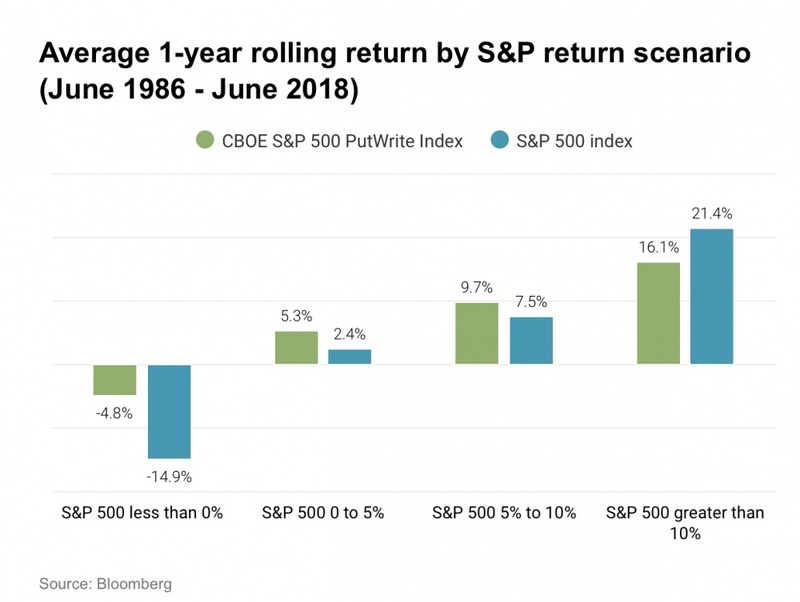 From 1986-2018, the below chart illustrates PUT (portfolio 1) compared to the S&P 500 total return index. Additionally, we can backtest approximately how the method used in our putwrite alerts would have compared to both of these indices (portfolio 2). Past performance doesn't guarantee future results, and please see this article for additional discussion on why future results may be lower. It is important to maintain realistic expectations, compared to our higher risk higher reward strategies like Steady Options and Creating Alpha. Please make sure you understand the performance goals before subscribing. Use momentum to inform our strike selection. When momentum signals are negative, farther OTM strikes will be used to increase our margin of safety. Actively manage the positions by closing/rolling them prior to expiration when the majority of potential profits have been earned. The benchmark index assumes all trades are held until expiration. Use low risk ETFs as collateral instead of Treasury bills/money market. Diversify across Large Cap, Small Cap, and International indices. Systematic. All alerts will be submitted based on pre-defined quantitative rules. Subscribers certainly can execute alerts based on their own discretion and risk tolerance, but I will not be providing personalized advice on the forums. Lorintine Capital is a Registered Investment Advisor providing managed accounts based on the Steady Momentum alerts. Contact myself or Chris Welsh if you are interested in further details. “Over the past 25 years, the CBOE S&P 500 PutWrite Index (PUT) has outperformed the S&P 500 index, with lower volatility and better risk-adjusted returns." For Portfolio 1 and 2 is there a way to get the returns on a yearly or even monthly time frame going back to 1987?